ENGLAND V SRI LANKA ODI SERIES / ONE-OFF T20I STATISTICAL HIGHLIGHTS. England Recently finished their first tour of this year’s winter by defeating Sri lanka in all three formats of the game. They won the 3-match ODI series against Sri Lanka 3-1, also won the one- off T20I game and then defeated SL 3-0 in the 3-match Test Series. Here, now lets have a look at some of the major Statistical higlights and records made and broken by our team in the series. starting with ODI series and one-off T20I. * Jonny Bairstow became the fifth England batsman to reach 1000 ODI runs in a calendar year. He became the first batsman to complete 1000 ODI runs in 2018 in Dambulla. * England won the 2nd ODI by 31 runs (DLS method) and it waswas only the 3rd time that England defeated Sri Lanka in Sri Lanka in an ODI while batting first.England batted first in 11 ODI matches vs Sri Lanka in Sri Lanka and lost seven of them. England won the 1982 Colombo ODI by five runs and the 2007 Dambulla ODI by 65 runs. * England Captain Eoin Morgan became the only player to be dismissed in the 90s in an ODI by Lasith Malinga.He is the Top scorer for England in this series scoring 195 runs with an average of 195. *·Joe Root got out for the first time in four ODI innings after scoring 309 runs. These are the most number of runs scored by an England player between two dismissals in the ODI format. previously Graeme Hick scored 301 ODI runs in 1999 between two dismissals. *·Adil Rashid has got 42 ODI wickets in 2018 so far and these are the second most by an England player in a calendar year. Previously John Emburey bagged 43 wickets in the ODI format in 1987. * Jos Buttler Captained England in the 5th ODI and it was the 3rd time that he was leading the team in an ODI. It was Jos’s 5th ODI as a Captain.Previoulsy he led the team in the 2nd ODI in the recently concluded series against Australia and he led the team for the first time in the three-match ODI series against Bangladesh in 2016 after their full-time Skipper Eoin Morgan pulled himself out of the series due to security reasons. 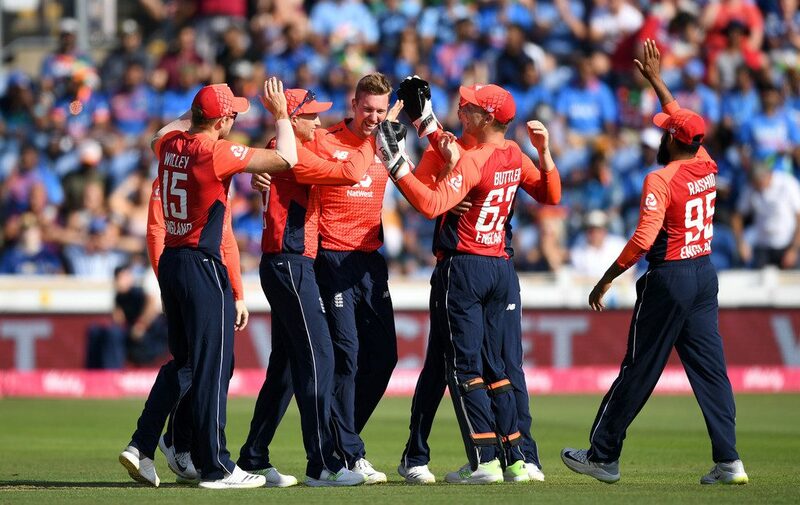 *·England’s 18 runs victory over Sri Lanka in the 4th ODI ( DLS method) gave them their ninth consecutive bilateral ODI series win. *·England Lost the 5th and final ODI to Sri Lanka by 219 runs. This 219 run margin is the first ODI defeat for England in excess of 200-run margin. Their previous biggest ODI defeat in terms of runs was by 165 runs against the West Indies in the 1994 Kingstown ODI while chasing 314. English Team after winning the one-off T20i at Colombo. pic credits : England Cricket. * As England defeated Sri Lanka in the only T20I, Eoin Morgan became England’s most successful T20I captain with 18 wins against his name. *·Joe Denly donned England Cap after 8 years and went on to become the first England spinner to claim a four-wicket haul in T20I cricket. Joe’s figures of 4/19 are the 2nd best by any bowler for England in T20I format behind Ravi Bopara’s 4/10 in 2011 in T20I against the West Indies at the Oval. * Joe Denly missed 79 T20Is since his last appearance in February 2010. These are the most consecutive number of T20Is a player missed for his team. He thus broke the record of his team-mate Liam Plunkett who missed 74 consecutive T20Is between 2006 and 2015. He missed 384 consecutive International matches since his last appearance for England in a T20I game in 2010. These are the second most successive matches any player has in International cricket. West Indies player Riyad Emrit missed 396 consecutive Internationals between 2007 and 2018 and Gareth Batty held the previous record as he missed 337 consecutive games between 2009 and 2016. *Adil Rashid’s figures of 3/11 in this game are the second best bowling figures by an England spinner in a T20I game. * Joe Denly and Adil Rashid’s collective bowling figures of 7/30 are the best by leg-spinners in a T20I inning. India’s Yuzvendra Chahal and Amit Mishra collectively recorded figures of 7/48 in the 2017 Bangalore T20I against England. Fair enough that they didn’t fly players over for one match but Dawid Malan has been harshly treated. He’s scored a record-breaking four fifties in his first five T20Is, the victim of an excellent run out in his one failure. Previous Previous post: SUMMER OF 2018..
Next Next post: ENGLAND V SRI LANKA STATISTICAL HIGHLIGHTS FROM THE TEST SERIES.